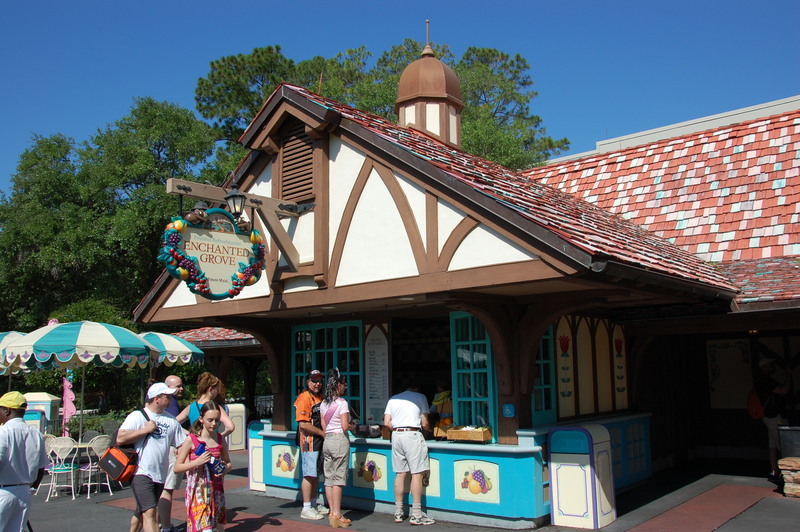 Walt Disney World announced that Snow White’s Scary Adventures – a ride in the Fantasyland area of the Magic Kingdom – will close forever in June 1, 2012. The area will be changed to a Disney Princess Meet-and-Greet location. In addition to Disney World, this there are Snow White’s Scary Adventures rides at Disneyland, Tokyo Disneyland, and Disneyland Park (Paris). Snow White did not appear in the 1971 version of Magic Kingdom’s Snow White’s Scary Adventures. The idea was for riders to feel like they were experiencing the scenes from Snow White’s perspective, though most guests didn’t understand that concept and wondered why Snow White wasn’t even in her own ride. In 1994, the ride was redesigned to include Snow White. The 1971 version of the attraction had seven figures of the witch, while the current version has six witch figures. 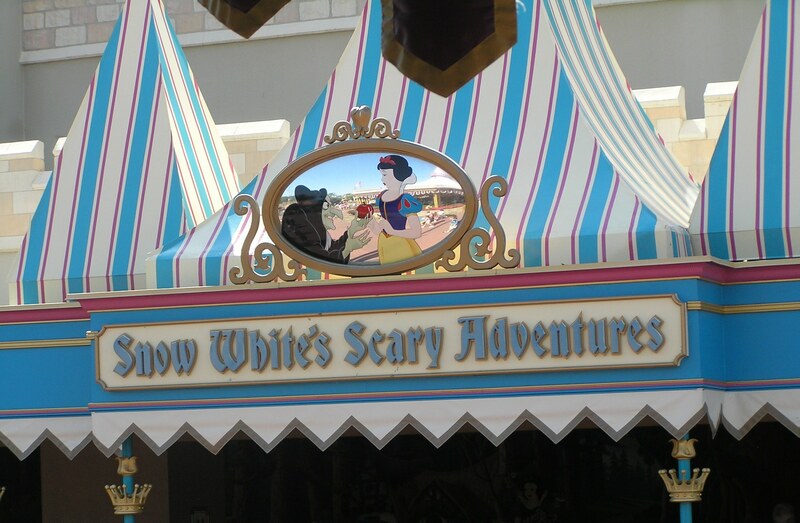 This is just my opinion but Snow White’s Scary Adventures isn’t one of Disney’s best attractions. If you’re going to Disney World between now and the end of May, go ahead and ride it just because it is closing. Don’t despair about missing it, if you haven’t ridden it – Disney is in the midst of a major Fantasyland expansion and it sounds like some great things are coming soon. December is such an amazing time to visit Walt Disney World. The theme parks and resorts are all decked out in their full Christmas glory and there is special holiday entertainment in each park. We’ve compiled a few tips to help you have a Better Mouse Trip. Avoid going to the Magic Kingdom and Epcot on Christmas Day and New Years Eve. There is a good chance that the park could close because of capacity level crowds and the lines will be horrible. Disney’s Hollywood Studios & Disney’s Animal Kingdom theme parks are much better choices for these days. December 1 – 21, 2011. News is getting out about the fun to be had in Walt Disney World in early December but the crowds are only mid-level and quite manageable. Just be sure to watch your “Mickey’s Very Merry Christmas Party” dates because the Magic Kingdom will close early those nights and won’t have the Disney’s Main Street Electric Parade, which replaced the SpectroMagic Parade. December 22, 2011 – January 2, 2012 – Christmas Break! You will experience “Holiday Crowds” which are even heavier than “Peak” crowds. Disney closed to capacity crowds several times during 06 Christmas Seasons and they expect the same thing to happen again this year. A good touring plan with “Best Days” information is absolutely essential if you don’t want to spend your whole vacation standing in line. Fantasmic! (Disney’s Hollywood Studios) –We’re so happy to report that Fantasmic! is being offered every night this month. This is a very popular show and we highly recommend it – arrive 70-90 minutes early, if you do not have a Fantasmic! Dinner package. Disney may add a second, later performance on certain evenings during the winter break – if they do, the later showing of Fantasmic! will always be less crowded than the earlier one. Warning: This show is excellent but it does feature villains for a good 8-10 minutes. The scene is fairly intense and can be frightening to small children. Disney’s Main Street Electrical Parade (Magic Kingdom) – This wonderful nighttime parade is not offered every night and the Magic Kingdom will be more crowded on days featuring a Disney’s Main Street Electrical Parade. The Disney’s Main Street Electric Parade will be presented on December 1, 3, 5, 8, 10, 12, 15, 17, 19, 20, 22, 23, 24, 25, 26, 27, 28, 29, 30, 31 and January 1, 2, 3. If Disney offers a second evening parade, the later parade will be less crowded than the earlier. Extra Magic Hours – (Special hours only available to Disney resort hotel guest) – We recommend that everyone avoid the Extra Magic Hour park of the day. Disney has 33,000 hotel rooms and no one goes to Disney alone – that means too many people are pointed in the same direction at the same time. You’ll have a much nicer time by going to a less busy park. This is doubly important if you are not staying at a Disney resort – you don’t want to get to the theme park and find a bunch of Disney guests in line in front of you. Pop Warner National Football, Dance, & cheer Events at Walt Disney World – December 3 – 12, 2011. These events take place at ESPN Wide World of Sports and the events themselves will not affect you. You may encounter groups of young athletes and their families in your resort, especially at the All-Star Resorts, and at the theme parks. Don’t let the chatter on some of the forums scare you – this event has a minimal impact on crowds. Enthusiastic youths can raise the noise level at the resorts though; guests staying at a value resort may want to add a request for a room in a quiet location to your reservation. Expect the resort food court to be busy at breakfast, if there are athletic groups staying at your resort. A good touring plan is a very important tool for dealing with Christmas Break crowds. You can have a great trip and avoid long lines by doing just a little advance planning that will make sure you see and do the things that are important to you in a way that keeps you ahead of the crowds.We provide three choices for custom touring plans – 1) a subscription to Tour Guide Mike, a highly respected online planning service and Disney planning community with 45,000 members, 2) the Unofficial Guide to Walt Disney World, the most popular guide book available with information on every resort, restaurant, attraction and activity, or 3) A subscription to Touringplans.com – at no charge to you when you book your trip through Build A Better Mouse Trip. Call us toll free at 877-815-6515. Beginning December 4, 2011 – Character lunches with Daisy and Donald Duck will be added to Tusker House Restaurant in Disney’s Animal Kingdom Theme Park. This location has offered a character breakfast for some time now and we’re very excited about the addition of lunch. In our opinion, character lunches are better than character breakfasts because you get to ride the rides while the crowds are at their lowest (morning) and then sit down for a meal when the crowds are heavier and you’re ready for a break. This location does participate in the Disney Dining Plan. November 11, 2011 – January 3, 2012 – Osborne Family Spectacle of Lights at Disney’s Hollywood Studios theme park. Millions of lights decorate the Streets of America backlot area. No extra charge – included with the cost of admission. Mickey’s Very Merry Christmas Party. Magic Kingdom – 7 PM to Midnight – November 8, 9, 11, 13, 15, 18, 27, 28, and 30; December 2, 4, 6, 7, 9, 11, 13, 14, 16, and 18. This event requires a special ticket – your Magic Your Way ticket won’t get you in. Tickets are $55 – $67 depending on the date and age of the participant. It is a fun event but it costs a chunk of change so use your own judgment as to whether this is a “must do” event for your trip. Just call and we’ll be happy to answer your questions or to book those tickets for you. If you are not doing this event, you will want to be aware that the Magic Kingdom closes early – at 7PM – on the nights of the Mickey’s Very Merry Christmas Party and they generally won’t have the Disney’s Main Street Parade those nights. Animal Kingdom – Mickey’s Jingle Jungle Parade ~ November 8, 2011 – January 3, 2012. A special holiday parade where Mickey Mouse and his friends celebrate teh season safari style. Christmas Church Service at Walt Disney World – December 25, 2011. Religious services are being offered at Disney’s Contemporary Resort in the Fantasia Ballroom. Catholic mass is December 25th at 8:00AM and 10:15AM. Protest service offered at 9:00AM. Guests are asked to use the WDW transportation to the Contemporary Resort – parking will not be available at the resort. Start at the Magic Kingdom and take the monorail to the Contemporary Resort or use the walking trail. Guests parked at the Walt Disney World Ticket and Transportation Center (also Magic Kingdom parking) can take the monorail to the Contemporary Resort. Ariel’s Grotto & Pooh’s Playful Spot (Magic Kingdom) have closed to make room for the big Fantasyland expansion project. Mickey’s Toontown Square (Magic Kingdom) closed on February 11, 2011. A new area is being contructed in this space. The Walt Disney World Railroad will continue to run but the Toontown Station will be closed during construction. The Disney Princesses, Mickey Mouse and Minnie Mouse Meet-an-Greets are now in the new Town Square Theater; FASTPASS tickets available. Tinker Bell and Friends are meeting guests at Tinker Bell’s Magical Nook at the Adventureland Verandah in the Magic Kingdom. Yakitori House (Restaurant – Epcot) will be closed August 8, 2011 – December 1, 2011. Disney’s Blizzard Beach (water park) – is closed October 20 – December 3, 2011 for its annual refurbishment. Disney’s Typhoon Lagoon (water park) – will be closed December 4, 2011 – March 17, 2012 for its annual refurbishment. Disney’s Polynesian Resort – Beach Sand Renourishment from Dec. 24, 2011 – Jan. 10, 2012. Disney’s Grand Floridian Spa will be closed from September 19, 2011 to Mid-2013. The fitness center will remain open. Spa services are available at The Spa at Disney’s Saratoga Stprings Resort. Disney’s Magnolia Golf Course will be closed November 28 – December 7, 2011. Disney’s Oak Trail Golf Course will be closed December 8 – 16, 2011. Disney’s Osprey Ridge & Lake Buena Vista Golf Courses will be closed Christmas Day, Dec. 25, 2011. Disney’s Magical Express (Airport Shuttle Service) -New luggage procedure for late night arrivals. Luggage service will no longer be available for arrivals to Orlando International Airport after 10:00PM. Collect your luggage at baggage claim and take with you to the Disney’s Magical Express check-in desk. At Build A Better Mouse Trip, we are convinced that everyone can benefit with good touring plans – this is even more important during holiday travel seasons. During busy times, a good plan will absolutely keep you ahead of the crowds and out of the lines – our clients typically wait less than 20 minutes for rides, even thrill rides and headliners. During less crowded times, a good plan factors in shorter park hours and fewer performance times. But the most important benefit of a good plan is that everyone gets to ride and see the things that they are looking forward to because everyone’s priorities are included in a plan that tours the parks efficiently and effectively. At Walt Disney World Resort in 2011, it begins to look a lot like Christmas as early as Nov. 8. Santa’s elves bedazzle every corner of the Vacation Kingdom for a seasonal spectacle filled with heartwarming stage productions, enchanting parades, garlands and wreaths, millions of sparkling lights and even the first flakes of winter. And with a ho, ho, whole lot of cheer being spread over more than a month, guests have more choice as to when they join in the magical, one-of-a-kind celebration. Mickey’s Very Merry Christmas Party – On 19 special nights, holiday revelers can delight during this cheery, family-friendly event. Party-goers embrace the joys of the season – sipping cocoa, catching a “snowflake” and enjoying merry shows, fireworks, carolers and special character meet and greets. Mickey’s Once Upon a Christmastime Parade, complete with a special appearance by Santa Claus himself, and for the first time Duffy the Disney Bear. Meet and greet opportunities with favorite Disney characters in Holiday attire, including Phineas & Ferb in Tomorrowland, the Seven Dwarfs in Frontierland and Duffy the Disney Bear in Town Square. A magical snow fall on Main Street, U.S.A.
Mickey’s Very Merry Christmas Party will take place Nov. 8, 9, 11, 13, 15, 18, 27, 29, 30, Dec. 2, 4, 6, 7, 9, 11, 13, 14, 16 and 18, 2011, from 7 p.m. until midnight. Day-of-event pricing is $62.95 and $57.95 for ages 3 to 9. Savings of $6 per ticket are available if tickets are purchased in advance. Visit Disneyworld.com/holidays. Castle Dream Lights – Each evening of the season, Cinderella Castle shimmers with lights brought to beaming brightness during a ceremonial show performed at dusk. Beginning Nov. 4 and continuing through Jan. 3, 2012, Cinderella and favorite Disney characters decked out in festive holiday garb take center stage and magically transform Cinderella Castle into an ice palace draped with 200,000 ice cycle-white lights – a breathtaking focal point to a park ready for revelers with wreaths, bows, garland, towering Christmas trees and scarlet poinsettias dominating the landscape. The Magic, The Memories and You! – The nightly light show on Cinderella Castle gets in “the spirit” throughout the holidays with a special segment that wraps the Magic Kingdom landmark in colorful bows and boughs, gift paper and ribbons, ornaments, candy stripes and multi-colored strands of lights … and gingerbread. Candelight Processional – An inspirational retelling of the Christmas story accompanied by a mass choir and 50-piece live orchestra punctuates the reason for the season during this time-honored Epcot tradition. Each evening Nov. 25-Dec. 30, 2011, a celebrity narrator (from a lineup that includes Steven Curtis Chapman, Marlee Matlin and Neil Patrick Harris) takes to the America Gardens Theatre stage and shares the story of Christ’s birth. Guests can sing along as the trumpeters and full orchestra offer a riveting performance featuring seasonal melodies. Shows are at 5, 6:45 and 8:15 p.m.
To ensure a seat for this memorable performance, Candlelight Dinner packages are available at select Epcot restaurants. They include a special fireworks viewing area and guaranteed seating for Candlelight Processional. For bookings call 407-WDW-DINE. Holidays around the World – Throughout World Showcase, international storytellers share traditions and tales from their homeland. Strolling along the promenade during the Holidays around the World celebration may put you face-to-face with the good-hearted witch La Befana, known in Italy for filling children’s shoes with treats, or the jolly gift-bearer Father Christmas in the United Kingdom. There are meet and greets with Santa and Mrs. Claus in the American Adventure, plus other legendary icons who share messages of goodwill. The celebrations of Kwanzaa and Hanukkah are celebrated as well. The evening is capped by “IllumiNations: Reflections of Earth,” the mesmerizing Epcot spectacular on World Showcase lagoon featuring fireworks, laser lights and water choreographed to a musical soundtrack – with a holiday finale. The Osborne Family Spectacle of Dancing Lights – Entering the Hollywood Studios backlot, guests discover a virtual city of lights. On, over and among the cityscape buildings are millions of dazzling bulbs, dancing lights and animated displays synchronized to high-energy holiday tunes at Disney’s Hollywood Studios Nov. 10-Jan. 7, 2012. The spectacle will not be operational Dec. 8. It’s truly a mega-watt spectacle for the eyes with colorful wreaths, twirling carousels, flying angels, Santa and his reindeer, swirling snow flurries, and amazing 3-D effects around every corner. The tradition began in 1986 in Arkansas, at the home of businessman Jennings Osborne, who strung 1,000 lights as a Christmas gift to his daughter. After the exhibit grew larger and brighter each year, it was transported to Disney in 1995 where the light exhibit now mesmerizes guests from all over the world each year. The tradition continues after Jennings’ death on July 27, 2011. Mickey’s Jingle Jungle Parade – King Louie and Baloo lead a rousing musical cavalcade – safari style – through the park from Nov. 10 to Jan. 3, 2012, during Mickey’s Jingle Jungle Parade. The wild side of Disney’s Animal Kingdom blends with a playful spirit of the holidays as Chip & Dale, stilt walkers and savannah friends dance alongside decorative floats at 4 p.m. daily. The savory scent of chocolate floats thru the air as Minnie’s candy cane and hot cocoa float roll by. Santa Goofy’s Holiday Village at Camp Minnie-Mickey has decked the halls big time with festive décor. A perfectly trimmed Christmas tree adorned with animal crafted ornaments welcomes guests at the park’s entrance. Carolers spread holiday cheer and Santa Goofy and friends greet guests for photo opportunities. With dozens of shops that stretch from the Marketplace to the West Side (and plenty of taste-bud-tempting treats! ), Downtown Disney is a shopper’s delight. There are one-of-a-kind boutiques such as TrenD, a sports shop at Team Mickey, plus enough toys, games, character merchandise, and costumes to fill Santa’s sleigh at Once Upon a Toy and World of Disney. There’s also Fuego by Sosa Cigars, Ghirardelli Chocolates, Basin (soaps and bath products), LEGO Imagination Center and much more – including Disney’s Days of Christmas where guests can choose Disney ornaments and decorations any season of the year. School choirs and bands often perform at the dock stage to ring in the season. Kids can pose for pictures and sit with Santa Claus, Nov. 19 – Dec. 24, 2011. Disney resort hotels are dressed up for the holidays, offering an ideal home-away-from-home during the season. An intricate, life-size gingerbread house cooked up by Walt Disney World pastry chefs is a must-see at Disney’s Grand Floridian Resort and Spa. The yummy sugar shack is baked with 1,050 pounds of honey, 600 pounds of powdered sugar, 35 pounds of spices and more. It even has a chimney that puffs out delicious cinnamon smoke. A magnificent gingerbread carousel complete with chocolate and soft-candy ponies and oversized candy-cane poles takes center stage at Disney’s Beach Club Resort. Other hotels are spruced up with wreaths and trees decorated with miles of garland, ribbon and glistening ornaments. Check each hotel for holiday dining offerings and special entertainment.